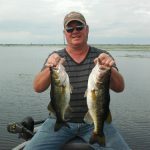 www.okeechobeejust4bass.com was working for Capt Mike Shellen today. I was fishing with Rodney Carver from Corsicana, TX. It was 6 hour trip using shiners. We caught 12 fish up to 5 lbs and it was mostly a cloudy day with light winds. Here is a picture of some of the fish he caught today.